The engineer who led many of Scotland’s landmark road and bridge schemes has been recognised for his lifetime contribution to the transport industry. Ainslie McLaughlin (right), who was director of major projects at Transport Scotland from its beginning in 2006 until earlier this year, was honoured at last week’s Scottish Transport Awards in Glasgow. He cut his teeth on the St James Interchange on the M8 in the 1990s and more recently has overseen and assisted in a portfolio of major schemes including the Clackmannanshire Bridge, the new Forth Crossing, the Borders Railway, and the Edinburgh Trams project. He is now director of procurement at the Scottish Government. BAM Nuttall was also a winner on the night, landing an award for “outstanding” collaborative working on the rail network. The contractor took the The Rail Supplier of the Year prize, endorsed by Network Rail, for the third time in a row. The Edinburgh-Glasgow Improvement Project is an example of the firm’s recent activity, involving the electrification of the main line between Edinburgh and Glasgow. So far BAM Nuttall has undertaken 49 possessions without over-runs. The BAM Nuttall team on stage in Glasgow. 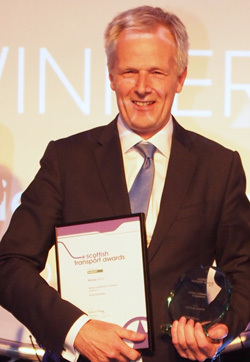 The 13th Annual Scottish Transport Awards were attended by 300 industry professionals. Top award of the night, Local Transport Authority of the Year, was presented to Glasgow City Council which undertook a range of important initiatives in 2014, much of it in connection with the 2014 Commonwealth Games.